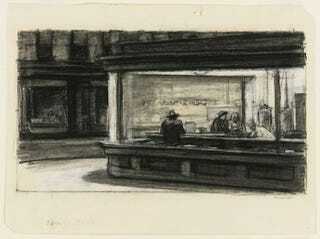 Cool article by Robin Cembalest over at Art News on Edward Hopper's storyboards for his famous painting, Nighthawks. Hopper, who started signing and dating his drawings at the age of ten and went on to make thousands more until his death in 1967, would have found the very idea of the show befuddling. Not because it took almost a half century after his death for any museum to focus a major exhibition on his drawings. But because a museum is showing his drawings at all. Hopper generally didn’t consider his drawings as art objects that should be exhibited or sold. To him, they were simply studio materials—documents of the process he used to conceive and to plot, in minute detail, the stories he told on his canvases. The Nighthawks drawings reveal how Hopper choreographed his voyeuristic scene of the nighttime convergence of the man, a couple, and a server in the eerie Deco diner, refining every nuance of the countertop, the figures, the architecture, and the effects of the fluorescent lighting. The diner first emerges in a compositional study with just a few slightly diagonal lines intersected by short verticals—just the essence of the painting’s spatial conception. But also present is a serpentine leg of one of the coffee urns, in the upper center. “This marvelous demonstration of both extreme specificity and near abstract compositional summation on the same surface beguilingly reflects how empirical observation and imagination coexisted in Hopper’s head,” curator Carter E. Foster writes in the catalogue. My favorite part of the painting is the left side of the canvas—the empty store across the street. Hopper sets it up for your eye to follow the space from light to dark. It's the part of the painting that you don't tend to look as much but it's crucial in the picture's overall composition.